Gatotkaca Java version is a half-giant, but not the forest giant. His mother was the daughter of King Arimbi Pringgadani Tremboko ofthe Kingdom. Tremboko Pandu's father died at the hands of thePandavas due to fights being waged Sangkuni sheep. He waslater succeeded by his eldest son named Arimba. 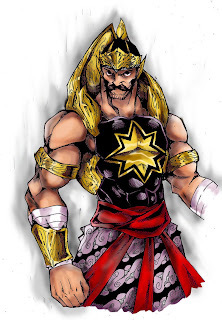 Arimba himself eventually died at the hands Bimasena at the time of the Pandavas to build the Kingdom Amarta. Pringgadani thronethen held by Arimbi who has diperistri Bima. The plan will besubmitted to the throne to their son as an adult. Arimbi had five brothers named Brajadenta, Brajamusti,Brajalamadan, Brajawikalpa, and Kalabendana. Brajadentaappointed as governor and were housed in KasatrianGlagahtinunu. Sangkuni Hastina come from the Kingdom ofinciting Pringgadani Brajadenta that the throne should be his notbelong Gatotkaca. As a result of such incitement, Brajadenta was about to seize the throne from rebel hands Gatotkaca the newly sworn in as king.Pro-Brajamusti Gatotkaca fight face his brother. The two giant twinwas killed together. Spirit then infiltrate both their palms into theGatotkaca left and right, so that their niece was manambah magic. After the incident raised Gatotkaca Brajalamadan as the newgovernor, title Patih Prabakiswa. 0 Response to "Gatotkaca Be King of Pringgadani"